It appears to be a race void of any real pace, leaving Russian Revolution the likely leader. If it plays out that way, Russian Revolution looks hard to hold out and the lack of speed would likely dent the chances of fancied runners Chautauqua, Astern, Spieth and English. But this is a very open $2.5 million Group One event, so there might be a few horses chancing their arm by going forward. If something decides to vie for the front, it's game on and brings a number of the previously mentioned quality horses - plus a few other outsiders - into the equation. And the question of just how wet the track will be is important for many runners. 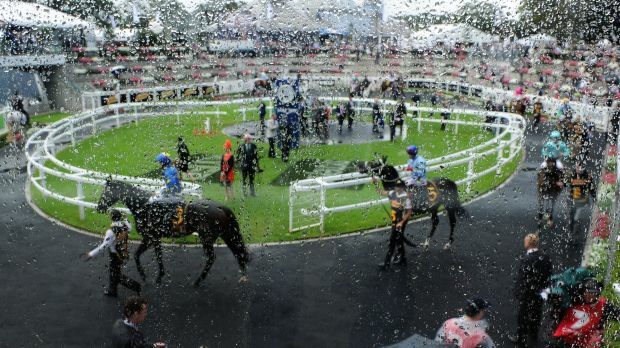 A number of trainers will be hoping the rain eases off and Randwick dries out towards the end of the day. Let's see if we can predict how it will play out and find the winner. There are some queries around the favoured, proven runners, and some value about some emerging horses. CHAUTAUQUA: There are no shortage of legitimate question marks around this talented gelding's chances of a third successive victory in the TJ Smith. But there's one thing for certain, and that is we'll be kicking ourselves if we let him go around and win at the likely juicy odds. However, the reality is the queries about his journey to the race are significant. He's dropping back from a 1500m run on a wet track after jockey Tommy Berry warned against pressing on with the Doncaster Mile path. The positives are he'll get the soft track he's won the past two editions of this race on and he's very fit. But the glaringly obvious negatives - including the preparation redirection with the drop back in distance, and whether he is going as well as he was in the past two years - are too profound to consider backing him. If he was flying and the camp hadn't set him for the mile, we'd be asked to take around even money. With the likely avalanche of money for Russian Revolution, we could get $6+ for Chautauqua. I can't back him, but at that price, there'll be no limit of lamenting if he salutes for the third straight year. MALAGUERRA: 'Big Mal' didn’t have much luck in the All Aged at this track last year after winning at Group 3 level the start before in Sydney. It's a positive that he's raced well this way of going (he also had no luck in the Stradbroke Hcp last year when in the wrong part of the track). There's a query on him on a really heavy track, but he's handled soft conditions before. Likely to get the gun run in behind Russian Revolution and he's a proven performer at his level. There's been excuses in most of the below-par runs he's produced of late (except for his most recent head-scratching run in the Orr Stakes). He's had a freshen up from that run, so he's clearly a winning hope. However, the query of a heavy track, and the average run last start in the Orr means I can't back him at the $10 quote. TERRAVISTA: The Joe Pride-trained sprinter can't be totally ruled out at big odds. However, he was plain last start in the Newmarket and where will he get to from barrier 12? He’s won on a heavy track - and that was here at Randwick - but that was nearly three years ago. The horse has turned into an enigma, and there's too many holes in his form to consider backing with any confidence. REBEL DANE: Goes well on the heavy but has barrier 15 and despite being a group one winner, there’s still doubts if he’s genuinely up to being consistently competitive at this level. JAPONISME: A funny horse to line up. He’s tried hard in his last two outings, and didn’t get a whole lot of luck last start. Not convinced he'll handle a track that's drenched, but softish will be no problem. Master trainer Chris Waller must be seeing something to have him in this race and at around the $31 mark, he gets a good run from the gate. Japonisme is one of a few blowout horses if the track conditions are in his favour. FELL SWOOP: If the track doesn’t get too wet, this bloke comes right into calculations. Hard to entertain him on a really heavy surface, but on a drying track he's a serious player. His run in this race last year was a ripper and performs well at Randwick. The 'Magic Man' is a key booking, he profiles well third-up here and gets 3kg off Russian Revolution. A must if the track is not too wet. SPIETH: If it wasn't for his last start Flemington failure in the Newmarket, Spieth would likely be vying for favouritism in this event. I'm loathe to call it a total failure because he was down on the unfavourable inside part of the track and was unsuited by the slow pace. Now he's the forgotten horse as he looks to score the elusive group one. But there's still a number of queries - will he be too far back in a race with little pace, and can he perform on a heavy track? He's won twice in a soft, but has never seen a heavy surface. Similarly to Chautauqua, he has too many queries and will go around at odds that'll make us kick ourselves if he salutes. VOODOO LAD: Plenty giving this sprinter a hope, but Darren Weir's record in Sydney remains too bad to ignore. Huge run in the Newmarket and now likely to get a gun run here, but suspect he still might be a few lengths of these sprinters. ROCK MAGIC: The run of this WA-sprinter last start in the William Reid wasn't missed by many, but I'd assume most weren't expecting him to lob in a highly competitive TJ Smith. However, the winner of the William Reid, Silent Sedition, ran well at her start prior in the Coolmore up in Sydney. Connections couldn’t believe how well the gelding pulled up after the run and headed to Sydney. He’s never seen a heavy track but has performed well in all runs on soft. Another positive is that he maps really well in the run if they don't absolutely walk in front. He should settle just behind the first half a dozen and must have something on a $51+. TARGET IN SIGHT: A handy sprinter who gives his all, but on form, he isn’t up these and he’s an even bigger query if it’s a genuine heavy track. TIVACI: This horse is flying. I love the three weeks between runs to keep some freshness in his legs. He had no hope in the Newmarket the way the race was run, but had the audacity to flash home at the end off a slow tempo. Trained as a sprinter this preparation and gets the services of Damien Oliver. He is an unknown on a really heavy track, but he ticks a lot of boxes and $34 is way over the odds. ENGLISH: Never went a yard in the Galaxy on a Heavy 10 and Blake Shinn was kind to her in the straight. Having said that, she's won on a Heavy 10 at Randwick the start prior, beating Redzel. Where does she get from the inside gate and will that part of the track be the place to be? She'll be right in the finish if she handles the conditions and the inside isn't off. ASTERN: Godolphin have taken a patient road to this race and signalled their intention that he’s going to be better suited next start in the All Aged. There's no denying he's got talent, but to me, he's way under the odds. He's handled soft ground before, but didn't do much on a heavy at his most recent trial. Happy to go around him. RUSSIAN REVOLUTION: Many punters predict he'll get a cozy run in front and control the race - but he's getting into rock-bottom odds now. He had a bit in hand winning last start but now he's got to step up to WFA. If they don't hand the lead to him on a platter, he's going to be vulnerable. DERRYN: Has a huge task but was arrogant swimming through the heavy track a fortnight ago. He shouldn't be nearly triple figure odds because he might be a serious horse on a bog track. Given the fact we know he grows a leg in the wet, and he has close-up form around Astern, Star Turn and Flying Artie, etc, I reckon he'll give you a run for your money at huge odds. The favoured runners in the market have some big questions marks around them. There are four runners at good odds who are right up to winning this race if things go their way. I've got Tivaci on top, with smaller bets on Fell Swoop and Rock Magic. Derryn is a must each-way play at the price. If you're playing the exotics, put this quartet in but add English, Chautauqua, Spieth and maybe even Japonisme. Happy to work around Russian Revolution and Astern.